Ipanema, is a premium Brazilian flip flops brand that is perfect companion for any adventure that you desire, be it summer escapade, rainy season comfort and more. Recently, Ipanema launches a campaign will give you a chance to try the wide variety of flip flops, brag it on your social media accounts at the same time win big prizes and receive amazing surprises. 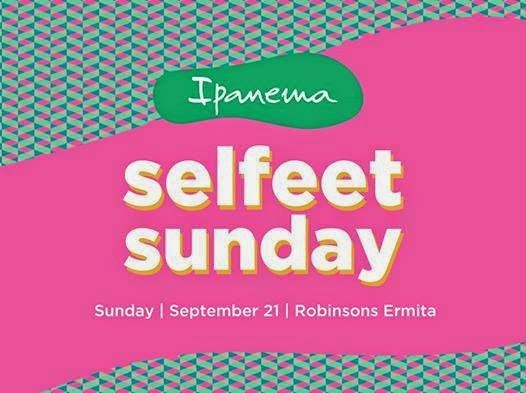 Ipanema, brings you #IpanemaSelfeet, a series of mall shows called Ipanema Selfeet Sunday. An open to the public event that feature the latest collection of Ipanema, celebrity appearances, games and a chance to win Ipanema flip flops. The Ipanema Selfeet Sunday events will start at Robinsons Ermita in Manila on September 21 (with JaDine, James Reid and Nadine Lustre), Ayala Center in Cebu on October 12 and Abreeza Mall on November 16. Go visit the event and enjoy !!! Ipanema branches nationwide includes SM City Lucena, SM City Clark in Pampanga, Centrio Mall in Cagayan de Oro, Bambu, Shoe Salon, and leading department stores like SM Department Store, Robinsons Department Store, Rustan's Makati and Landmark. You may visit and follow Ipanema on Facebook/IpanemaPhilippines for more updated datails, news and information.